Whether you have a lot of users in your company or just a few, you can separate your Carbonite users into groups. Grouping users makes it easier to find a specific user or categorize them into departments. A user can only be in one group at a time, but can be transferred between groups at any time. 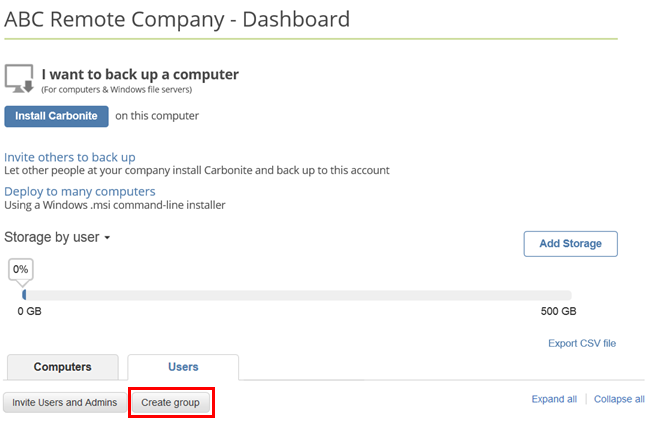 If you are a Carbonite Safe Pro administrator, you can group users from the admin dashboard. Sign into your account as an administrator at https://account.carbonite.com. Once you have signed in, you will see a list of users on your account displayed in the admin dashboard. To create a new group, click Create Group. On this screen, you will provide a name for the group and add users to that group. Type in a name for the group into the fields provided and mark the checkbox for each user you wish to add to that group. Once finished, click Create and the group will be created for you. You do not have to assign users to a group at this time. After you have completed creating your group, there will be a Groups tab within the admin dashboard. Clicking Groups will show you all the groups in your business account along with some basic information about each.